Cartilage tumors vary in severity from benign enchondroma to low-grade malignant chondrosarcoma to the highest-grade dedifferentiated chondrosarcoma. Chondrosarcoma is the second most common primary malignant bone tumor, accounting for 10-20% of all primary bony malignancies. [1, 2] Enchondroma, which consists of benign endosteal cartilage, is much more common than chondrosarcoma. The true incidence of cartilage tumors is unknown because many are discovered incidentally. Often, there is no clear distinction between benign and low-grade malignant cartilage tumors. This is particularly problematic with very-low-grade chondrosarcomas (so-called borderline chondrosarcomas). Presented below for illustrative purposes are two cases that initially presented as clinically, radiographically, and pathologically borderline cartilage tumors and eventually demonstrated aggressive metastatic behavior, as well as a third case in which a radiographically and histologically benign enchondroma was detected only after it had undergone dedifferentiation into a high-grade osteosarcoma and resulted in a pathologic fracture. Prospective controlled studies have not firmly established the appropriate treatment for borderline or low-grade (grade 1) malignant chondrosarcomas. Some authors have suggested that extended intralesional curettage may be acceptable for both types. However, in the case studies described below, limited resection was clearly insufficient to control borderline cartilage tumors and resulted in an unexpectedly poor outcome. Caution should be utilized both in making the distinction between benign and malignant cartilage tumors and in selecting the appropriate surgical treatment for grade I chondrosarcomas. In addition to the conventional intramedullary tumors, both benign and malignant cartilage tumors may be found in periosteal locations or in soft tissue. Secondary chondrosarcomas may arise in an osteochondroma, in an enchondroma, or in the setting of enchondromatosis (Ollier disease or Maffucci syndrome) or multiple osteochondromatosis. The secondary chondrosarcomas are more likely to occur in patients with multiple cartilage tumors and typically present as a painful, progressively enlarging bony mass. Classically, because chondrosarcomas are known to be resistant to radiotherapy and chemotherapy, wide resection has generally been accepted as recommended treatment for low-grade chondrosarcoma. [23, 24, 25, 26, 27, 28] Borderline cartilage tumors have an even lower metastatic potential than the true low-grade (grade 1) malignant chondrosarcoma. [11, 17] Thus, recommended treatment of these borderline tumors has ranged from marginal curettage and grafting to limited local resection. 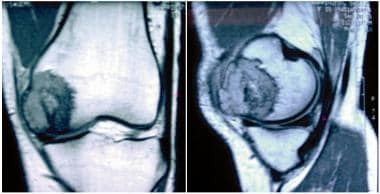 A 38-year-old female athlete presented with a minimally painful lump on the medial side of her left knee (see the first image below). She underwent open biopsy with curettage later that same month. Histology at that time showed benign enchondroma with focal atypia (see the second image below). Original MRI of a patient demonstrating a lesion extending beyond the boundary of normal bone. 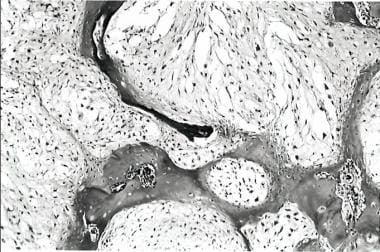 Histology of original lesion demonstrating what was thought to be a benign enchondroma with some atypical features. Recurrent tumor demonstrating progression from a purely low-grade lesion to a mixed low- and intermediate-grade lesion. One year after the first recurrence, the patient developed a second recurrence and underwent wide resection and reconstruction of the distal femur. The tumor within the distal femur was a high-grade dedifferentiated chondrosarcoma with osteosarcomatous features (see the image below). She then underwent adjuvant chemotherapy for osteosarcoma. Tumor from distal femur at time of reconstruction demonstrating dedifferentiated chondrosarcoma. Five months after the second recurrence, the patient developed lung metastases. Biopsy of the lung lesions revealed dedifferentiated chondrosarcoma. One month later, she developed a recurrence of the high-grade sarcoma in the popliteal fossa. The patient underwent above-knee amputation and died of progression of the lung metastases 1 year later. A 39-year-old man presented with anterior bowing of his right femur and a leg-length discrepancy. At age 16 years, he had undergone an osteotomy to correct the angular deformity. 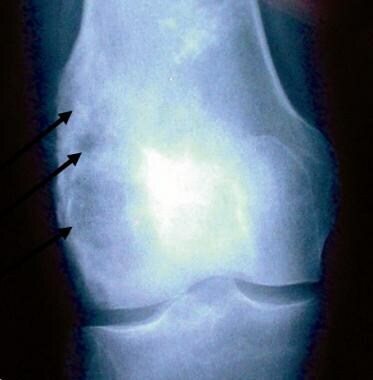 Plain radiography of the right distal femur revealed a cartilage tumor in the distal femur. 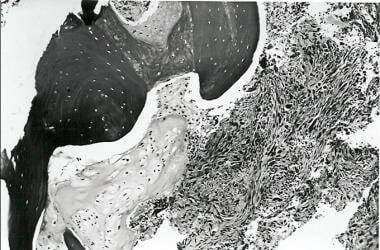 MRI demonstrated disruption of the anterior femoral cortex, with thinning of the articular cartilage. The patient underwent curettage and bone grafting. Histologic examination revealed a well-differentiated cartilaginous tumor, and a diagnosis of benign enchondroma was favored (see the first image below). The original osteotomy was apparently through the enchondroma (see the second image below). 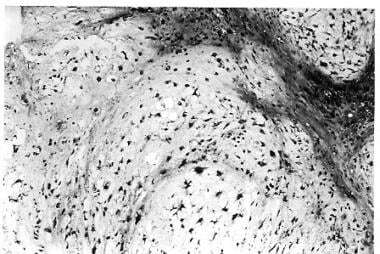 Tumor from pin sites revealing a well-differentiated cartilaginous tumor. The diagnosis of benign enchondroma was favored at this point. AP radiograph of the knee demonstrating a tumor around screw holes. The patient reported recurrent knee pain 20 months after curettage and bone grafting and underwent repeat curettage. 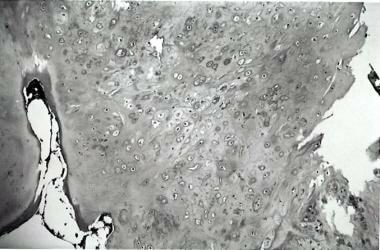 The histology showed progression to grade 2 chondrosarcoma (see the image below). Follow-up CT showed a lytic lesion in the posterior femoral condyle extending to the distal femoral joint line. He underwent wide resection with distal femoral replacement 2 months later. The histologic examination confirmed grade 2 chondrosarcoma. Histology at time of recurrence showing progression to grade 2 chondrosarcoma. Thirteen months later, CT of the chest revealed approximately 20 small pulmonary nodules. 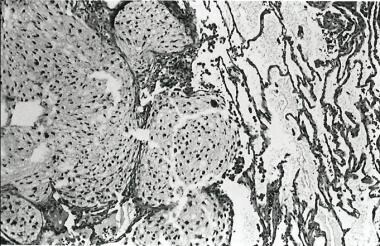 The resected lung nodules all revealed grade 2 chondrosarcoma that was histologically identical to the tumor excised from the distal femur (see the image below). The patient initiated chemotherapy. Six months later, he had multiple enlarging nodules but remained asymptomatic, and he refused further treatment. Histology showing grade 2 chondrosarcoma within lung metastases. This tumor was identical to the tumor resected from the distal femur. A 70-year-old man sustained a right supracondylar femur fracture after stepping out of the bathtub. Incisional biopsy of the fracture site was performed. 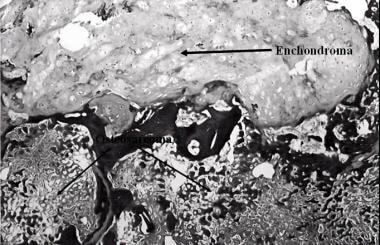 Histologic examination revealed a high-grade osteosarcoma with soft tissue extension sharply juxtaposed to an enchondroma (see the image below). He underwent right hip disarticulation 1 week later. He declined chemotherapy. Lung nodules appeared on chest radiography 2 months postoperatively. CT confirmed the presence of multiple pulmonary nodules consistent with metastases. Histology at fracture site demonstrating sharp juxtaposition of benign enchondroma with osteosarcoma. Cases 1 and 2 are examples of grade progression from a borderline tumor to a grade 2 chondrosarcoma. Both patients underwent limited resection of their original borderline chondrosarcomas, but the disease recurred as higher-grade tumors at 19 and 20 months from initial presentation, respectively. The patient in case 1 refused wide resection at recurrence and eventually developed lung metastases after dedifferentiation at the primary site. Whether this poor outcome could have been prevented with wide resection of the recurrent tumor is unknown. The patient in case 2, on the other hand, did undergo wide resection of recurrent tumor, but metastasis occurred nevertheless. Although both cases underscore the need for wide resection of the recurrent chondrosarcoma, the second case questions the safety of conservative management for borderline chondrosarcoma. Case 3 is an example of what appeared to be a solitary benign enchondroma that dedifferentiated into a high-grade osteosarcoma. This is a rare event, with only a few cases reported in the literature. Although wide excision would not be the recommended treatment for a benign enchondroma, this case serves as another example of an unusually aggressive cartilage tumor. Healey JH, Lane JM. Chondrosarcoma. Clin Orthop Relat Res. 1986 Mar. 119-29. [Medline]. Rizzo M, Ghert MA, Harrelson JM. Chondrosarcoma of bone: analysis of 108 cases and evaluation for predictors of outcome. Clin Orthop Relat Res. 2001 Oct. 224-33. [Medline]. Altay M, Bayrakci K, Yildiz Y, Erekul S, Saglik Y. Secondary chondrosarcoma in cartilage bone tumors: report of 32 patients. J Orthop Sci. 2007 Sep. 12 (5):415-23. [Medline]. Ryzewicz M, Manaster BJ, Naar E, Lindeque B. Low-grade cartilage tumors: diagnosis and treatment. Orthopedics. 2007 Jan. 30 (1):35-46; quiz 47-8. [Medline]. O'Connor MI, Bancroft LW. Benign and malignant cartilage tumors of the hand. Hand Clin. 2004 Aug. 20 (3):317-23, vi. [Medline]. Gajewski DA, Burnette JB, Murphey MD, Temple HT. Differentiating clinical and radiographic features of enchondroma and secondary chondrosarcoma in the foot. Foot Ankle Int. 2006 Apr. 27 (4):240-4. [Medline]. Chow WA. Update on chondrosarcomas. Curr Opin Oncol. 2007 Jul. 19 (4):371-6. [Medline]. Rozeman LB, de Bruijn IH, Bacchini P, Staals EL, Bertoni F, Bovée JV, et al. Dedifferentiated peripheral chondrosarcomas: regulation of EXT-downstream molecules and differentiation-related genes. Mod Pathol. 2009 Nov. 22 (11):1489-98. [Medline]. Akay I, Oxmann D, Helfenstein A, Mentlein R, Schünke M, Hassenpflug J, et al. Tumor risk by tissue engineering: cartilaginous differentiation of mesenchymal stem cells reduces tumor growth. Osteoarthritis Cartilage. 2010 Mar. 18 (3):389-96. [Medline]. Unni KK, Inwards CY. 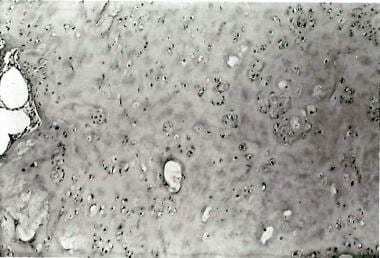 Chondrosarcoma (primary, secondary, dedifferentiated, and clear cell). Dahlin's Bone Tumors: General Aspects and Data on 10,165 Cases. 6th ed. Philadelphia: Lippincott Williams & Wilkins; 2010. Chap 6. Springfield DS, Gebhardt MC, McGuire MH. Chondrosarcoma: a review. Instr Course Lect. 1996. 45:417-24. [Medline]. Douis H, Parry M, Vaiyapuri S, Davies AM. What are the differentiating clinical and MRI-features of enchondromas from low-grade chondrosarcomas?. Eur Radiol. 2018 Jan. 28 (1):398-409. [Medline]. Lisson CS, Lisson CG, Flosdorf K, Mayer-Steinacker R, Schultheiss M, von Baer A, et al. Diagnostic value of MRI-based 3D texture analysis for tissue characterisation and discrimination of low-grade chondrosarcoma from enchondroma: a pilot study. Eur Radiol. 2018 Feb. 28 (2):468-477. [Medline]. Crim JR, Seeger LL. Diagnosis of low-grade chondrosarcoma. Radiology. 1993 Nov. 189 (2):503; discussion 504. [Medline]. Eriksson AI, Schiller A, Mankin HJ. The management of chondrosarcoma of bone. Clin Orthop Relat Res. 1980 Nov-Dec. 44-66. [Medline]. Mankin HJ, Mankin CJ, Simon MA. The hazards of the biopsy, revisited. Members of the Musculoskeletal Tumor Society. J Bone Joint Surg Am. 1996 May. 78 (5):656-63. [Medline]. Tsuchiya H, Ueda Y, Morishita H, Nonomura A, Kawashima A, Fellinger EJ, et al. Borderline chondrosarcoma of long and flat bones. J Cancer Res Clin Oncol. 1993. 119 (6):363-8. [Medline]. Yasko AW. Treatment of low-grade chondrosarcoma. Curr Opin Orthop. 2000. 11:471-8. Weber KL, Pring ME, Sim FH. Treatment and outcome of recurrent pelvic chondrosarcoma. Clin Orthop Relat Res. 2002 Apr. 19-28. [Medline]. Liu C, Xi Y, Li M, Jiao Q, Zhang H, Yang Q, et al. Dedifferentiated chondrosarcoma: Radiological features, prognostic factors and survival statistics in 23 patients. PLoS One. 2017. 12 (3):e0173665. [Medline]. [Full Text]. Bauer HC, Brosjö O, Kreicbergs A, Lindholm J. Low risk of recurrence of enchondroma and low-grade chondrosarcoma in extremities. 80 patients followed for 2-25 years. Acta Orthop Scand. 1995 Jun. 66 (3):283-8. [Medline]. Carsi B, Sim FH. Recurrent classic chondrosarcoma of the extremities. J Bone Joint Surg. 2001. 83-B Suppl:164. Harwood AR, Krajbich JI, Fornasier VL. Radiotherapy of chondrosarcoma of bone. Cancer. 1980 Jun 1. 45 (11):2769-77. [Medline]. Lack W, Lang S, Brand G. Necrotizing effect of phenol on normal tissues and on tumors. A study on postoperative and cadaver specimens. Acta Orthop Scand. 1994 Jun. 65 (3):351-4. [Medline]. Lee FY, Mankin HJ, Fondren G, Gebhardt MC, Springfield DS, Rosenberg AE, et al. Chondrosarcoma of bone: an assessment of outcome. J Bone Joint Surg Am. 1999 Mar. 81 (3):326-38. [Medline]. McNaney D, Lindberg RD, Ayala AG, Barkley HT Jr, Hussey DH. Fifteen year radiotherapy experience with chondrosarcoma of bone. Int J Radiat Oncol Biol Phys. 1982 Feb. 8 (2):187-90. [Medline]. Oestreicher-Kedem Y, Dray TG, Damrose EJ. Endoscopic resection of low grade, subglottic chondrosarcoma. J Laryngol Otol. 2009 Dec. 123 (12):1364-6. [Medline]. Leddy LR, Holmes RE. Chondrosarcoma of bone. Cancer Treat Res. 2014. 162:117-30. [Medline]. Brown MT, Gikas PD, Bhamra JS, Skinner JA, Aston WJ, Pollock RC, et al. How safe is curettage of low-grade cartilaginous neoplasms diagnosed by imaging with or without pre-operative needle biopsy?. Bone Joint J. 2014 Aug. 96-B (8):1098-105. [Medline]. Chen X, Yu LJ, Peng HM, Jiang C, Ye CH, Zhu SB, et al. Is intralesional resection suitable for central grade 1 chondrosarcoma: A systematic review and updated meta-analysis. Eur J Surg Oncol. 2017 Sep. 43 (9):1718-1726. [Medline]. [Full Text]. Chen YC, Wu PK, Chen CF, Chen WM. Intralesional curettage of central low-grade chondrosarcoma: A midterm follow-up study. J Chin Med Assoc. 2017 Mar. 80 (3):178-182. [Medline]. [Full Text]. Smith GD, Chalmers J, McQueen MM. Osteosarcoma arising in relation to an enchondroma. A report of three cases. J Bone Joint Surg Br. 1986 Mar. 68 (2):315-9. [Medline]. This patient has an enchondroma. Radiography typically shows well-defined, sharply marginated medullary lesions, often with punctate ring and arclike calcifications. Bone infarcts may appear similar to enchondromata on plain radiography. CT scanning is recommended to evaluate the extent of endosteal scalloping. This patient has a chondrosarcoma. The MRI demonstrates a lesion in the proximal humerus, with extension through the cortex into the soft tissues. The distinction between enchondroma and chondrosarcoma is extremely difficult, even with complete radiographic and histopathologic evaluation.